The Pacific House was constructed in 1847 during U.S. occupation of California. Over the years, this adobe was used as storage for the U.S. Army, a hotel, a court house, a tavern, and in later years, as offices. Come visit the newly-redesigned, interactive exhibits and displays. 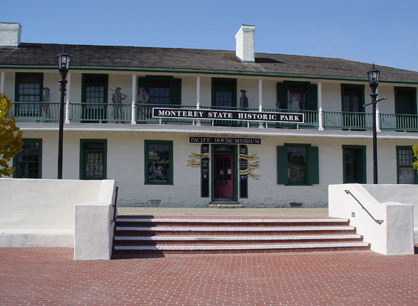 Exhibits tell the exciting story of Monterey when it was the capital of Spanish and Mexican California. The Monterey Museum of the American Indian, located upstairs, presents beautiful baskets, pottery and other Native American artifacts. In back, through stucco arches, one can find a little fountain bubbling in a quiet pool. Flowers and lush green plants accentuate the stark whiteness of the garden walls. The lovely Memory Garden was once the site of bear and bull fights staged by the townsfolk on Sundays.